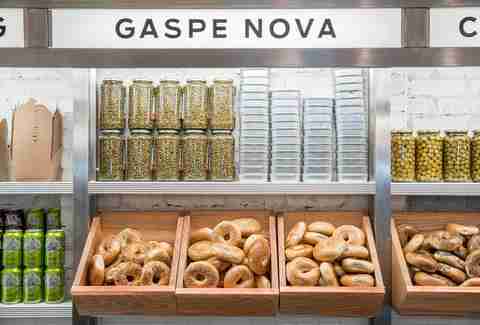 New York City is a haven for the kosher eater. There are at least 300 kosher restaurants in the city (more if you include those with less-stringent supervision), running the gamut from special-occasion steakhouses, to one of the city's best new BBQ spots, to a burger joint that rivals its non-kosher brethren. For the uninitiated, kosher restaurants don't serve pork or shellfish, don't mix milk and meat, and closely inspect produce for bug infestation. Restaurants under more stringent supervision (such as OK Kosher Certification, also known as "OK") are closed for Shabbat, which runs from Friday sundown to Saturday sundown; those under more lenient supervision (such as United Kosher) may be open every day. Focusing primarily on Manhattan, where there's the highest per-capita concentration of kosher spots, we've put together this guide to the city's best kosher restaurants -- making it easy for kosher-law observers to find something for every occasion. Modern Israeli chef Einat Admony entered the New York kosher restaurant scene in 2005 with a tiny vegetarian falafel bar in the West Village, eventually expanding to Nolita and introducing a truck that crosses Manhattan and Brooklyn with a more limited menu. 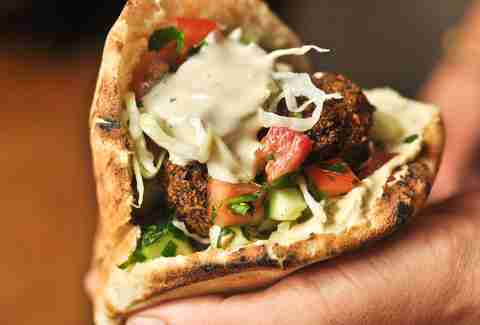 At Taïm -- the Hebrew word for "tasty" -- fried-to-order chickpea fritters are stuffed into fluffy pita or sabich (pita filled with fried eggplant and slices of hard-boiled egg). Both sandwiches come topped with creamy hummus, chopped cucumber-tomato salad, and cabbage. For a truly authentic experience, drizzle yours with the pickled mango sauce (amba) and Yemenite chili paste (s'chug). The Nolita location has more space to sit than the West Village original, but both are still extremely small, and waits can be long (especially at lunchtime) so order ahead on the website or app to skip the line. Kosher pizza places are generally known for having thick pies sporting rubbery cheese and a scattering of canned mushrooms, reheated in industrial ovens until cardboard stiff. That's far from the case at Pizza da Solo, which features a cave-like wood-burning oven and a pizzaiolo who churns out 10in Neapolitan pizzas to order. The crust is puffy, charred, and blistered with a slightly soupy center; the mozzarella and ricotta are house-made; the toppings are fresh; and there's even a pizza with shaved truffles on it. The margherita is the way to go on your first visit, but after that, try the salad pizza -- arugula, apples, and Brie doused in honey and balsamic and served on an oil-rubbed crust "plate." Located in a rustic former warehouse in Gowanus, the less-than-a-year-old Bison & Bourbon offers the best Saturday-night-out option for the kosher crowd. There are DJs, bottle service, late closing hours, handcrafted cocktails, and small plates (like beef "bacon"-wrapped dates and jars of pickled vegetables). It's quieter during the week, and if you want to focus on the food, it's best to arrive before the 8pm rush. On the main menu, the move is to opt for the lamb ribs, flatbreads, and sides (like bourbon-glazed cipollini onions). Be forewarned: An 18% gratuity is tacked onto every check. The burgers at Mocha Burger are good enough to rival their non-kosher brethren: Thick, grass-fed patties are topped with brisket pastrami, a fried egg, or crisp smoked lamb bacon. Salad, grilled chicken, and fish options are available, but you're here for the burger, which gets delivered to the table speared with a knife. The downtown location has ample seating (including a long table to accommodate groups up to 10) plus attentive servers and a full bar, while the "express" spot on the Upper East Side offers counter service and a few tables. Finding a kosher Midtown lunch spot where you can host non-kosher colleagues and clients is not the easiest thing. 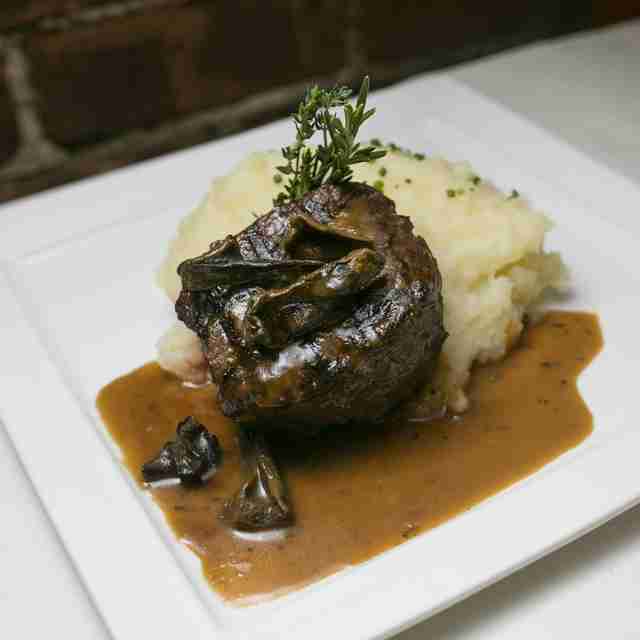 Luckily, there's Wolf and Lamb, perfectly situated within walking distance from Grand Central. Wolf and Lamb has an old-school steakhouse vibe (white tablecloths, leather-bound menus, waiters in ties) and 15 years of experience getting people back to their offices before that 1:30 conference call. In the afternoon, opt for the lamb burger, a completely inauthentic (but no less good) Swiss cheese-less Reuben sandwich, or the lemon tarragon chicken salad. If you come at night for a more leisurely dinner, go for the rib-eye. 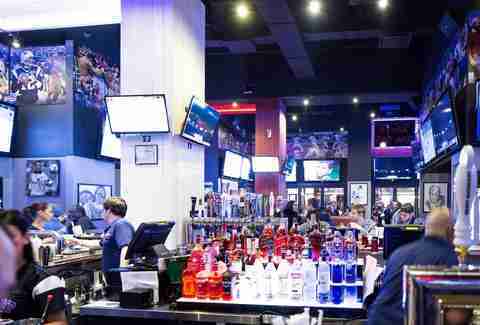 With 45 60in flat-screen TVs covering the walls, over two dozen beers on tap or bottled, a menu almost as vast as the Cheesecake Factory's, and pitcher and appetizer specials nearly every night, Promenade is the perfect place to gather your friends to watch a game. The bar became fully kosher after a successful experiment with a small kosher sushi bar in the back, and the menu now ranges from tailgate burgers and dogs, to the aforementioned sushi, to a dozen or so salads and wraps. Bonus points for ample charging stations for your phone. Ahimsa is the newest kosher Indian restaurant in New York City, and one of the few to fall outside the "Curry Hill" stretch of Lexington. Its zen-like interior sets the tone for a relaxed meal (though if you're in a rush, the inexpensive lunch buffet that includes a paper-thin dosa makes it easy to pop in and out). The dishes are just spicy enough without being overpowering and, even stewed, the ingredients are obviously very fresh. Popular picks include fluffy vegetable-filled uttapam pancakes, northern curries, creamy rice pudding kheer, and thali (a platter of small bowls offering samples of a half-dozen flavors). The staff easily accommodates dietary restrictions and allergies, given that it also caters to Jain clientele. 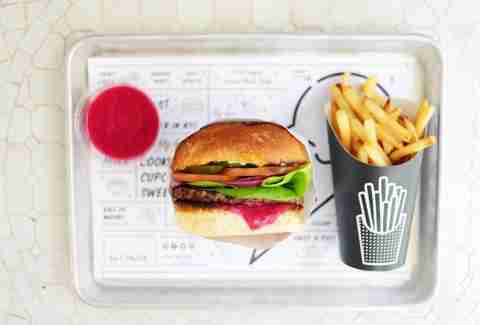 This fast-casual vegan mini-chain makes all the kale salads, cold-pressed juices, and chia puddings you'd expect, but it's the veggie burgers, air-baked fries (sweet potato or original), cashew mac & cheese, and whiskey barbecue (mushroom and seitan) sandwich that keep the lines around the block. Be sure to also check out Sweets by CHLOE., a bakeshop located next door to the original West Village location, which offers guilt-free cupcakes and a wafer-thin cinnamon espresso chocolate chip cookie as big as your face. 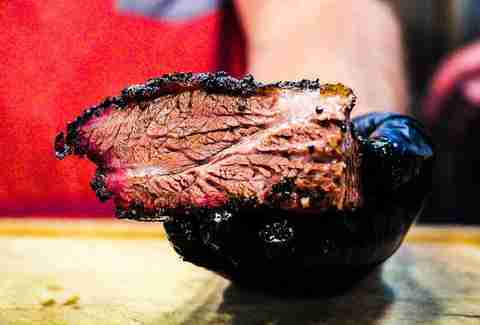 Less than a year after opening, Izzy's Brooklyn Smokehouse took second place in the 2016 NYC Brisket King competition's "smoked" and "all-around king" categories, bested only by Danny Meyer's Blue Smoke and kosher barbecue maven Wandering Que, respectively. And if you're among the throngs of kosher-eating fans vying for one of the two dozen seats in this counter-service-only storefront, you'll probably bump into some renowned non-kosher pitmasters paying their respects. The meat here is served by the pound (best bets are the dinosaur ribs and brisket) along with sides like tangy red slaw, bread-and-butter pickles, and candied sweet potato on paper-lined trays. Georgia (the country in the Caucuses, not the American state) is known for a fused, East-meets-West cuisine that's hard to come by in New York. In order to offer the full range of authentic specialties, Marani owner Ana Epremashvili pressed to establish both meat and dairy kitchens under the same roof -- a feat largely unheard of in the kosher community. Start in the basement where a baker rolls out breads, including khachapuri adjaruli, boat-shaped bread filled with stretchy sulguni cheese and egg. 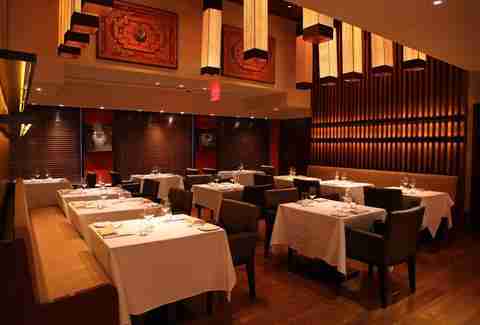 Then make your way upstairs to the main restaurant, where it's best to come with a large group. Vegetable and walnut pkhali pâtés and a few herb-laden salads serve as palate cleansers before the rest of the meat-centric meal. Don't miss the steamed khinkali beef and lamb dumplings (which wouldn't look out of place on a Chinatown dim sum cart), harcho lamb soup, and an assortment of kebabs accompanied by tkemali sour plum sauce. Little has changed at this Theater District brasserie in the 20-plus years since it opened -- including the dark wood paneling, framed vintage posters, and apron- and vest-adorned servers. 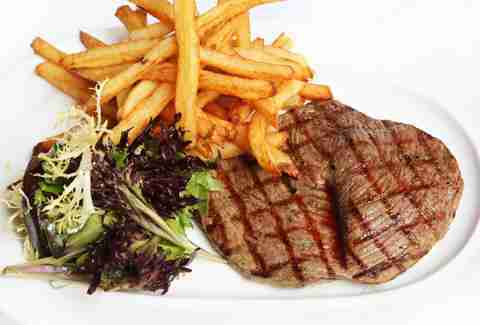 Start with the charcuterie plate, followed by either the steak frites or the lean and tender tournedos. If the restaurant isn't holding an event, ask to sit upstairs where there's usually more room and a few oversized leather club chairs. While there's no set pre- or post-theater menu, the restaurant's proximity to Broadway and late hours make it your best option when you're catching a show. 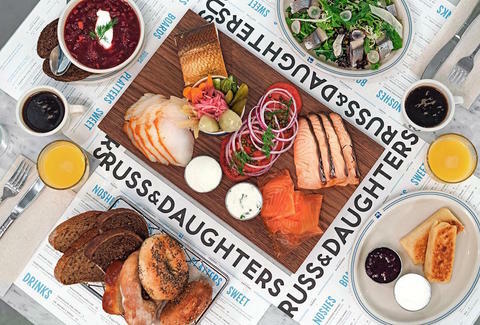 Part restaurant, part takeout counter, Russ & Daughters at the Jewish Museum is the first kosher location of the iconic Lower East Side appetizing counter. Smoked fish is obviously the main event here, and there are seven different salmons available, in addition to sable, tuna, whitefish, and trout, which can all be sliced to order for sandwiches or platters with tomato, onion, capers, and a shmear. 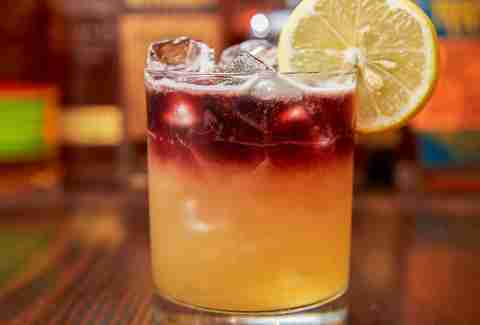 Chase it with an egg cream, either the original or the fershnikit (Yiddish for "drunk") version with whiskey. Saturday is the only day you can make a reservation, but the menu is set and prepayment is required to accommodate Sabbath observers (there's also free museum entry that day). On Sundays brunch starts at 9am, and if you don't like to wait in line, you should aim to get there as early as possible -- or get your food to go and eat it across the street in Central Park. If breakfast-for-dinner is your thing, the cafe is also open 'til 8pm on Thursdays. 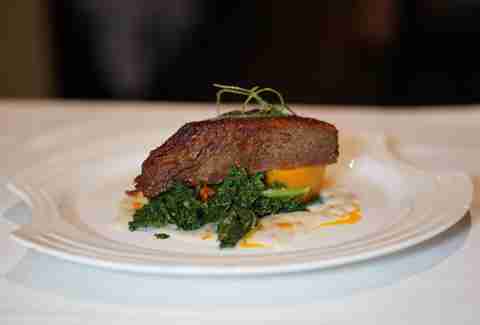 Arguably the nicest kosher steakhouse in New York City, Reserve Cut is worth a splurge for special occasions. The steak is sourced from the owner's high-end Brooklyn butcher shop and dry-aged on site for at least five weeks, the wine list is extensive and on display in a glass-enclosed cellar (which you walk through to get to your table), and the dining room is always elegantly set. Coming up with non-dairy desserts that are comparable to normally cream-laden ones is challenging, so a pastry chef is a rare and welcome addition to the Reserve Cut kitchen team; opt for the creme brulee or the caramelized apple tarte Tatin perched on a salted sable Breton "butter" cookie. One of the first upscale kosher restaurants to not be a steakhouse, Mike's was a staple of the Upper West Side kosher landscape for over a decade before moving east two years ago to a larger space with an expanded menu. Chef/owner Mike Gershkovich's menu has traditionally veered towards Italian, and many of his classics -- duck gnocchi, grilled veal chop over parsnip mash, braised short ribs, lamb shank with eggplant -- remain, in addition to newly added crudos and a half-dozen "simply prepared" proteins " You're likely to catch Chef Mike roaming the dining room most evenings, and it's even more likely that he'll stop by your table to check on your meal, ready to accept your praise or fix anything (if there is anything) that hasn't hit the mark. Gayle Squires is a food writer, doctor, and health-care consultant, but she refuses to develop healthy recipes. Follow her on Instagram or her blog.